It was only a year ago, nearly to the date, that the Carolina Panthers voided the three-year, $24 million contract that they had just offered to free agent cornerback Bashaud Breeland due to a failed physical stemming from a laceration in his foot. Now, Breeland is signing with his second team in as many years, as the Kansas City Chiefs offered the 27-year-old a one-year deal worth up to $5 million. The Chiefs were certainly in need of an additional outside cornerback, especially after Steven Nelson headed to Pittsburgh as a free agent. Of the cornerbacks left on their roster, only Kendall Fuller graded above 70.0; as for the other three cornerbacks to receive snaps for the Chiefs last season, Orlando Scandrick is still awaiting a new team in free agency and younger options – Charvarius Ward and Tremon Smith – combined for just 327 snaps including the postseason. That is the group that Breeland enters. The Clemson product has graded as high as 74.0 overall in 2015 (20th out of 112 qualifying cornerbacks). However, last season, Breeland only recorded a 58.5 overall grade across 330 defensive snaps with the Green Bay Packers. That was his lowest grade since his rookie season in 2014. It should be noted that Breeland played 187 snaps in the slot compared to just 89 out wide after playing the vast majority of his snaps out wide in the first four years of his career. With Fuller and the newly signed Tyrann Mathieu manning the slot, the Chiefs will likely bump Breeland back outside – a position where he has seen more success overall in his career. Since entering the league, Breeland has a 70.0 coverage grade when lined up out wide. That drops all the way down to 49.3 when he moves inside to the slot. Though he didn’t have his best season in terms of overall grade in 2018, quarterbacks did not have success when looking his way. In weeks 10-17, Breeland allowed 12-of-23 passes thrown into his coverage to be completed for 168 yards along with two interceptions and three forced incompletions. That passer rating allowed of 39.8 was second best among 106 cornerbacks with at least 100 coverage snaps over that span. As the overall grade would suggest, that wasn’t all Breeland’s doing, but for a team lacking playmaking options at cornerback, it’s intriguing, nonetheless. 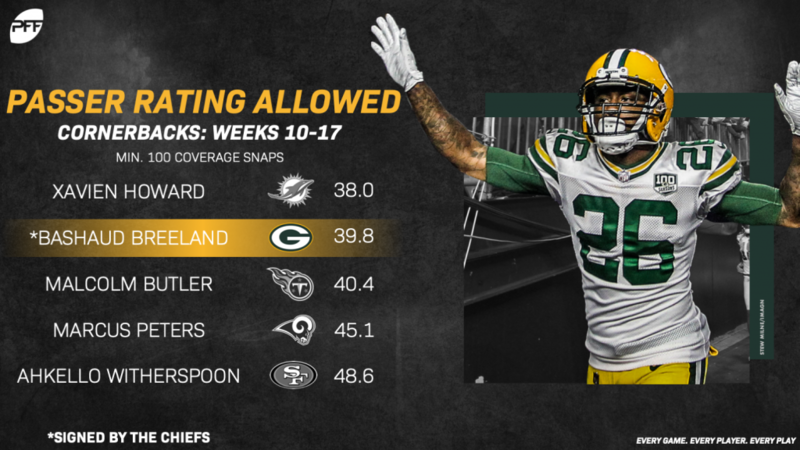 Given his experience and the potential number-one cornerback talent that he has shown at times in his career, Breeland will likely jump to the top of a thin cornerback group in Kansas City.